Venezuelan president Nicolás Maduro’s recent call for the creation of a National Constituent Assembly has raised even more questions in Venezuela’a already agitated political landscape. While the main government figures portray it as the deepening of the revolutionary process established by Hugo Chávez, the main opposition figures call it the “continuation of a coup d’état”. The measure surprised the popular classes, the government’s electoral base, and among an already diminished chavismo, appeared not to sit well. The vagueness of Maduro’s announcement seemed to leave a negative feeling among those who supported the 1999 Constituent Assembly. Eri’s husband, José Ávila is a 29 year old auto mechanic. For months he hasn’t been able to cover his family’s basic necessities with his job. Because of this, he started to buy coffee beans, grind them, and sell them for a small profit that would let him feed his two school-age children. But the idea of a constituent assembly is not, in itself, immediately dismissed by people for whom the current economic situation has created a level of desperation that calls out for an immediate solution wherever it may come from. The opposition has seen a weakness in Maduro’s move. 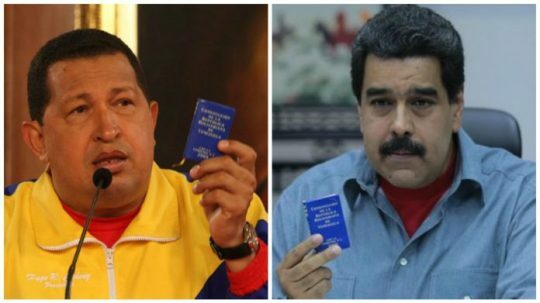 In the days following the announcement, they began to refer to the Constitution as “Chávez’s legacy,” using Chavismo’s own argot. But even though she still defends herself as Chavista, Erlinda doesn’t seem very convinced by Maduro’s new plan. For Erlinda, ever since “her commander” came to power things in the country changed for the better, and a picture on her wall of “her comandante” in his green military uniform and red beret reveal her devotion. But her support for Chavismo is flagging.